In the not-so-distant past, a business website was somewhat of a novelty. We were all just finding our way in this new online age, and most subscribed to the “if we build it they will come” mentality. Then things changed. The Web matured and standards began to emerge. It became clear that well-organized and thoughtfully-presented content was necessary to stand out among the crowd. Today, we realize that anyone with a bit of grit and determination can have a “professional looking” website in less than an hour using myriad online DIY site builders. So the bar has been raised again. Users demand engagement, and a modern business website now serves as the digital hub for the entire business domain—from marketing to client onboarding to managing vital business systems and processes. That is where we fit in. We build custom web applications to meet the ever-changing needs of your organization. No cookie-cutter. No duct tape. No “Frankensteined” solutions. Now that’s beautiful. 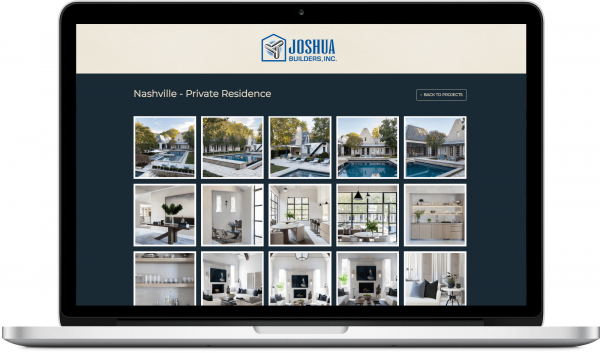 Joshua Builders Inc. specializes in custom homes built in collaboration with clients. The Company has established its reputation on the principle of being "Builders of Integrity". They believe in high standards of construction and professionalism that produce both structural integrity and integrity of character. Nissi Creative Services is a web consultancy and development shop based in Nashville, Tennessee. We are passionate about our craft and look forward to helping turn your ideas into reality. ©2019 Nissi Creative Services. All rights reserved.